Salat is to perform the Islamic prayer in a prescribed form. Its importance for Muslims is indicated by its status as one of the Five Pillars of Islam. It is enjoined upon every adult Muslim of sound mind to pray five times a day. The exhortation to offer prayer is found on numerous occasions in the Quran and described in the ahadith. the beginning of the Prayer. Wudu, meaning ablution, is obligatory prior to a prayer. Hands should be washed three times with water and the mouth rinsed with water three times. Then, the nose internally cleaned by pushing water into the nostrils three times. The entire face should be washed three times. After this, the whole of the forearm up to and including the elbow should be washed three times each, starting with the right. Then, having wetted the hands with some water again, a pass should be made over the head with both hands, palms downwards with thumbs outstretched so that almost the whole head is covered by this in a passing motion. At the end of this motion, the ears should be cleaned with the tips of the forefingers. All fingers are then joined together and the hands are inverted so that the palms now are facing outwards. With the back of the hands, a pass is made from the nape of the neck to the front of the neck. Lastly the feet should be washed up to the ankles inclusive, three times each, again beginning with the right. Normally, Salat should be offered in congregation in a mosque. The worshipers stand in a row behind the Imam, the person who leads the prayer, all facing towards the Kaba. Where congregations are of mixed gender, the Imam chosen will always be a man as this was the practice at the time of the Prophet of Islam, Muhammadsa. One reason for this is that the Imam must prostrate with the congregation at his back and such positions may be considered undignified for a woman to take with men standing behind her. The rows must be perfectly straight and the worshipers should stand shoulder to shoulder but in no way in a position to interfere with each other's prayer. The Prayer starts with Takbir-i-Tahreema, i.e; the Imam raises both hands to the level of his earlobes and says اَللهُ أَكْبَرْ (Allahu Akbar, God is the Greatest). All worshipers follow. Al hamdu lillahi Rabbil alamin. Ar-rahmanir-Ra him. Maliki yaumiddin. Iyyaka nabudu wa iyyaka nastain. Ihdinas-sirat al-mustaqim. Siratallathina anamta alaihim, ghairil maghdubi alaihim wa ladhdhalleen. Thereafter, the Imam recites a portion of the holy Quran. At the end of the recitation, the Imam goes from the standing position to the bowing position, called Ruku, by calling out 'Allahu Akbar'. In the bowing posture the following Tasbih is recited silently three times: سبحان ربى العظيم (Subhana Rabbiyal Azhim, Holy is my Lord the Most Great). The Imam then straightens up and stands with his arms by his sides. When he initiates this movement, he recites Tasmee loudly which is an indication for the congregation that to change the posture from bowing to standing: سمع الله لمن حمده (Sami allahu liman hamidah, Allah listens to him who praises Him). Then the Imam says Allahu Akbar loudly again and leads the congregation into the prostration called Sajdah. In this posture, the knees, hands, nose and the forehead of the worshiper should be touching the ground. The head should be placed on the ground between the two hands. The arms should be away from the ground and away from the worshiper's sides. The abdomen is kept away from the thighs. The fingers are held together pointing towards the Kaba. The feet should be planted on the ground so that the toes are bent in the direction of the Kaba.The worshipers silently recite سبحان ربى الأعلى (Subhana Rabbiyal ala Glory to my Lord, the Most High) three times or more. The imam then says Allahu Akbar again, at which he and the congregation raise their heads and then hands from the ground and go into the sitting position called Jilsa. Attahiyyatu lillahi wassalawatu wattayibat. Assalamu alaika ayyuhan nabbiyyu wa rahmatullahi wa barakatuh. Assalamu alaina wa ala ibadillahissalihin. Ash hadu alla ilaha illallahu wa ash hadu anna Muhammadan abduhu wa rasuluh. Following durood, worshipers may silently recite prayers of their own choice. They then end salat by saying السلام عليكم و رحمة الله (Assalamo Alaikum wa Rahmatullah, Peace and mercy of Allah be upon you) while turning their face towards the right and to the left. 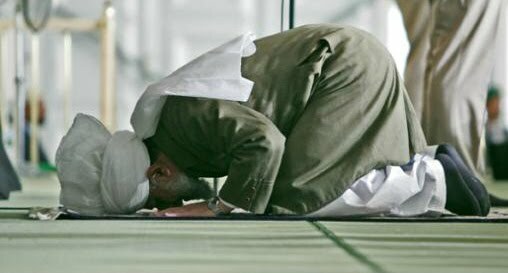 The present Caliph of the Ahmadiyya Muslim Community, Hazrat Mirza Masroor Ahmad, highlighted how offering the five daily prayers in congregation at a mosque is compulsory for Muslim males during his Friday Sermon on 13 February 2015. He added that if an Ahmadi mosque is too far to reach on a particular prayer, the worshiper should at least strive to offer the prayer in congregation with others, for example family members. In cases where a prayer is offered individually, it is offered exactly in the same way as when led by an Imam, except that whatever the Imam recites loudly, is instead recited silently. Fard is an Arabic word which means compulsory or obligatory. There are five obligatory prayers everyday. Hazrat Mirza Masroor Ahmad delivers Friday Sermon from Baitul Futuh Mosque in London. Friday Prayer is offered in congregation. It is offered in place of Zuhr Prayer. Each week on Friday, Muslims are required to take a bath, dress in their best clean clothes, wear perfume and assemble in the mosque for Friday Prayer. The following prayers are regarded as wajib (necessary) Prayers: Three rakat of salat-al-vitr. Two rakat of Eid-ul-Fitr and two rakat of Eid-al-Adha. Two rakat offered while performing the tawaaf (circling) of the Kaaba. Muhammadsa offered extra rakat of prayer in addition to those of fard prayers. These Prayers are called sunnah Prayers. These are optional prayers. One example of a set of nafl prayers are the eight rakat of Tahajjud. Another example is Taraveeh prayer during Ramadan. One may offer as many nafl prayers as one wishes. However, nafl should not be offered during the forbidden times for prayers. For example, they should not be offered between Asr and Maghrib prayers. Under certain conditions, two Prayer services may be offered together. For example, Zuhr may be immediately followed by Asr. Or Maghrib may be immediately followed by Isha. In his Friday Sermon on 13 February 2015, the present Caliph of the Ahmadiyya Muslim Community, Hazrat Mirza Masroor Ahmad, condemned the practice of needlessly combining prayers. a. If a person is sick. b. If a person is on a journey. c. During rain or a storm. d. If it is difficult to go to the mosque because of general discomfort caused by heavy rains. Anas reported that when the Messenger of Allahsa had to set out on a journey hurriedly, he delayed the noon prayer to the earlier time for the afternoon prayer, and then he would combine them, and he would delay the sunset prayer to the time when the twilight would disappear and then combine it with the Isha prayer. 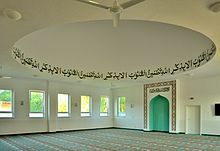 Our mosques are open to anyone who wants to worship God...Those who deny the Promised Messiah's claim to be the reformer of the age, the prophet of the age as raised by Allah Himself, you can't say your prayer behind them, because imamat in prayer is just a symbol - the true imamat comes from Allah. Imamat means leadership, so if Allah has revealed a relgiious leadership, those who have broken contact with that leadership, become hostile to that leadership, how can they remain imams to you? So an Ahmadi can never say his prayer behind a person who denies the Promised Messiah and calls him an impostor, because if you do that then you follow him in that and behind an imam your own intention simply does not mean anything. Whatever imam intends, you follow.